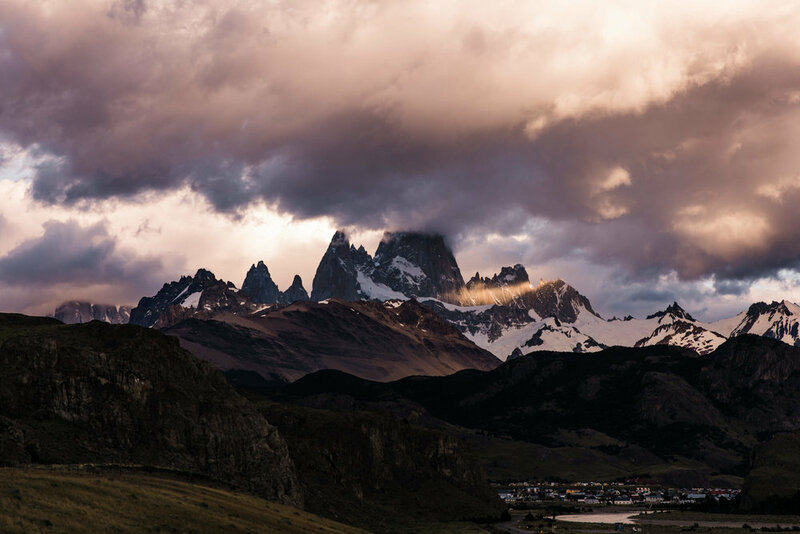 I've been sharing a series of blog posts from our adventures in Patagonia. We flew into El Calafate, Argentina and rented a car for a cross-country road trip through Argentina and Chile that brought us to deserts, mountains, glaciers, waterfalls, and just about everything in between. It was incredible! To see an overview of our entire trip via Instagram posts, head to this blog. To see our first few days in El Calafate, head here. For our first visit to El Chalten, head here. 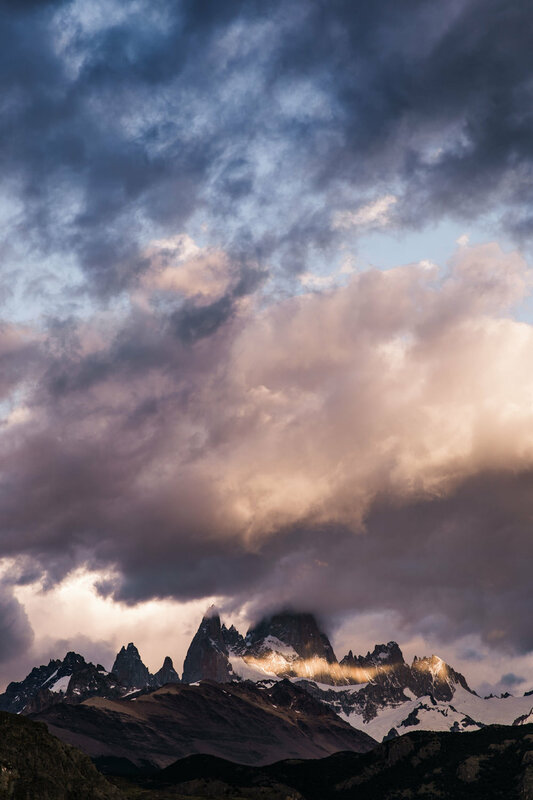 As much as I enjoyed experiencing the rain and fog in El Chalten, I left the first visit in tears because we never saw Fitz Roy (read more about that here). After a few conversations with Callen about it when we were in El Calafate packing up our second rental car, we decided to stop by El Chalten a second time on our way north in hopes of better weather. 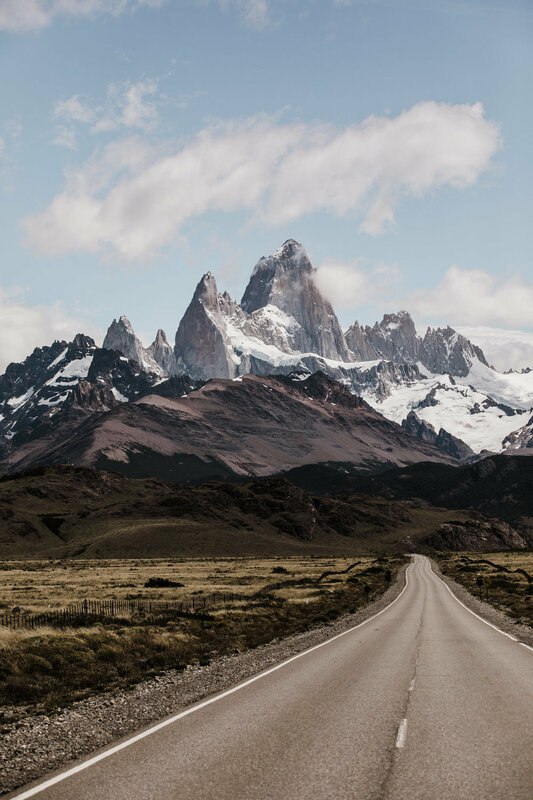 As we drove toward the mountains, we saw a giant peak coming out of the horizon miles and miles away, and I knew immediately it was Fitz Roy. Like the feeling of seeing an old friend, I was filled with warm fuzzy excitement, and then awe at how huge it really was. The rest of the drive I couldn’t take my eyes off of it, afraid if I did it’d disappear into some clouds like it had a few days before. But we made it to El Chalten and the Fitz stayed above us, looming over the entire range. Finally we pulled off the road to soak it in. I am pretty sure I didn’t take my eyes off the mountain for more than a few minutes for the next 24-ish hours as we grabbed coffee at Patagonicus (sitting on the patio to watch Fitz of course), walked the streets of town, and finally drove back out to a view point for sunset. We sat through intense winds for hours watching the clouds swirl around the mountain. The sun finally fully set around 10:30pm and I curled up in the back of our tiny rental car for a few hours of sleep before the morning’s first bit of light began illuminating the mountains again. I crawled to a space on the hillside, still in my sleeping bag, and watched the landscape go from dim blue pre-dawn light to fully colorful as the sun rose and painted the clouds. It was so windy, so cold, and so full of magic. Physically, I should have been miserable in such conditions, but my mind was so overrun with wonder as I watched the mountains I’ve spent years dreaming about. That less-than-24-hour visit to El Chalten made the trip for me. I would’ve been satisfied going home right then, but adventure was calling, so we set our sails north to explore more of this wild region. The next few blog posts will detail our 4000km road trip through Argentina and Chile!